Large sites that have many pages, templated content and lots of sub-categories are the most at risk. If you haven’t been monitoring and fixing your accessibility issues, as highlighted in Google Webmaster Tools, you are at risk. Early April was the big UK introduction of Panda. There is a smaller inflection in July. There is a bigger inflection in October. I know these guys well. They have no idea this data exists or anything about panda, but they have done OK. I love the green line. Did they even know they had benefited from Google Panda? Did they think they had done something to deserve the new traffic? Was it all Champagne, cocaine and cash bonuses and then three months later, the next panda update smacks them? The blue line benefits from the first Panda update and then it looks like they get hit by Panda a few months later, but I don’t think that’s Panda, I think that’s development gone wrong. Panda smacks and recovery are one day to the next, not across a number of weeks. Given this graph, where would you go to look for examples of sites that are being rewarded by Google Panda? Find the websites that benefitted from Panda and look at their content, as that is now the new minimum level of content quality in your industry. This data is for Prezzybox, who we worked with. Panda recovery is possible, but a lot of unplanned, un-budgeted blood, sweat, tears and money went into that dip and recovering the traffic. 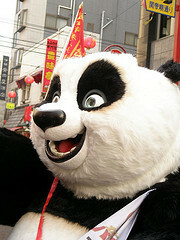 Panda is confusing if you are not on top of your data and industry news. There were so many updates it becomes easy to blame everything bad on Panda. Conversely there are sites which benefitted from Panda but did not attribute it. When we started exploring how to fix Panda, we moved quite conservatively. Now we suggest that people take strong, decisive action in resolving issues. Google Panda doesn’t fix itself, you have to fix it. It will take time, money and effort. It also requires a change in how you see your online business. You can make this whole process a lot easier on your business if you put a person in charge of content, and give them a budget and developer time. The advice is quite simple, concentrated around a few key areas. The implementation is where companies fall down. Fixing Panda is not complex, but it does require a lot of work. Give someone the responsibility to hunt down duplicate content. Use Google Webmaster tools or SEOmoz tools or Xenu or an IIS crawl (or whatever people suggest in the blog comments). Solve duplicate content issues with rel=canonical. Here are seven short videos of Google’s Matt Cutts talking about different aspects of implementing rel=canonical. If you have a section that is just thin templated content, it is hurting the good contents’ ability to rank. Be strong and cut the crap or add to your content to improve it. 404 a bad section or area and after the pages have dropped out of the index, 301 them somewhere good so you don’t lose any incoming link juice. This is potentially the biggest win. SEOmoz has a good guide to 301s, including links to references for 301s under Apache and IIS. There is no getting around the fact that time and effort is needed here. Someone in your organisation needs the time and responsibility to sit down and create great content or manage the creation process via third party writers. I believe that great content requires both qualitative and quantitative research and a knowledgably person to knit it together to suit both users and search engines. Here is my guide on taking mediocre content and making it great content and an overview from our work on Panda on how Google might interpret content quality signals. Write content, hire interns or find people in cheaper parts of the world. Many companies are unnecessarily precious about their content and ultimately this ends up hurting more than helping them. Elance, Odesk and Copify all work for building out content. (Remember, you now have a person responsible for content quality who will oversee this). Run an IIS crawl to find your accessibility issues (IIS is easier to use than you think). You will end up with a list of issues and the urls where those issues are occurring, to be able to go and fix them. Google is going to continue to raise the quality bar with future updates. When your competitors improve their websites, you will be weakest and in line for the chop at the next quality update. I hope this post helps you decide to build great content today, so you dont have to deal with the fallout from bad content tomorrow. I’ve gathered together ten great infographics on m-commerce, QR codes, apps vs web, coupons, payments, mobile marketing and more.